This little bunny was out on the media trail earlier this week, hopping over to Eagle Junction Primary to meet some fellow book lovers. The kids were adorable and full of smiles, and we had lots of fun doing silly poses for the cameraman (the photo they chose was probably the most traditional). 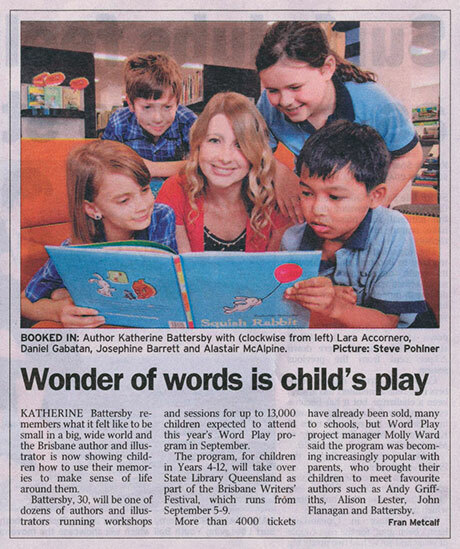 It was all in the name of Word Play, the amazing kid’s stream at the Brisbane Writers Festival. The 2012 program launched this week and I’m thrilled to be involved. I first attended this amazing festival as a book lover, then as an aspiring book writer, and this year will be my first presenting as an actual real live author (woo). You can check out the program online here, and have a sneak peek at all the amazing children’s writers and illustrators who’ll be doing readings and workshops here. I have three talks and a workshop spread across the days, where I’ll be talking all about writing and ideas and characters, as well as doing some Squish Rabbit readings. The kids who attend might even get an early peek at Brave Squish Rabbit too. The festival runs from 5th – 9th September on the sunny banks of the Brisbane river. Hope to see you there!